I was recently leading a design consultation with a lovely bride-to-be and the most wonderful father-of-the bride I’ve ever met — so utterly engaged in the meeting. Absolutely doting on his daughter and full of thought provoking questions and great insights! We’re enthralled in conversation, reviewing inspiration boards, talking about various centerpiece designs and he asks “Is the whole branch thing overdone?” And I thought “Wow, this guy is good.” And then I asked him if he wanted a job. Seriously though, it’s a great question. Most of us have seen a manzanita tree in some form or fashion and maybe we’re not as crazy about curly willow as we once were, but I continue to see and envision new and exciting ways to incorporate some of these tried and true botanicals. One of my favorite branches that is growing in popularity is the eco-friendly grapewood. Native to California and collected from naturally fallen debris, it is stripped of it’s bark and sanded. It’s knobby and gnarly and oh so beautiful. And while you might naturally think of it being used in a more rustic environment, I personally love the juxtaposition of bringing it in to more modern affairs. 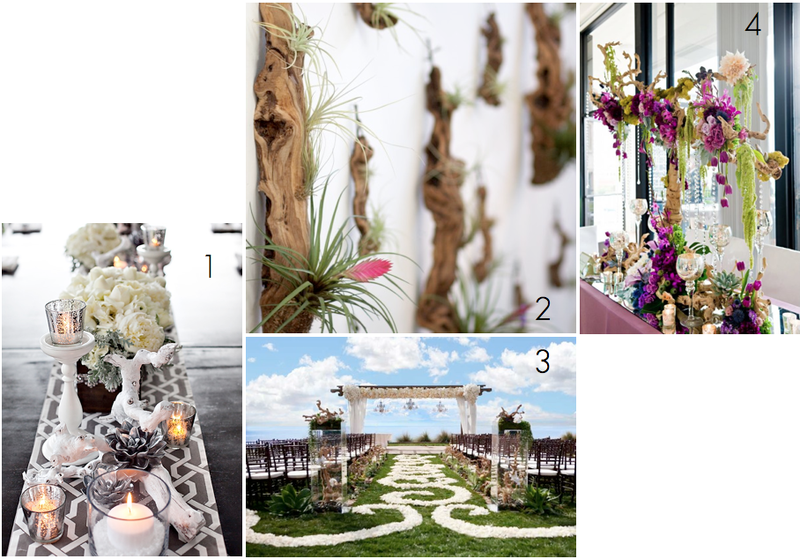 Images credits from 1 – 4 to JL Designs, Flora Grubb Gardens, Karen Tran Florals and Blush Botanicals.